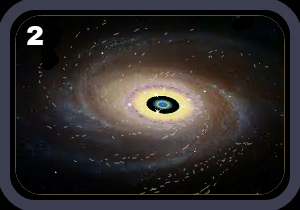 " How a Wonderful Scene of Divine Galaxy "
We observe very beautiful divine Galaxy in very attractive and charming colours circulating around the Adhisthan in internal divine universe, at 9-30 am on 7-11-2016. Some planets are shining like Stars in it liking very graceful and touching my Heart, which we show with the help of some images giving below. 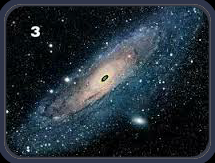 Do you know what will be happened if Shristi chakra or galaxy cycling will be paused (stop) for few moments in space ? As show in image no:-1.
" 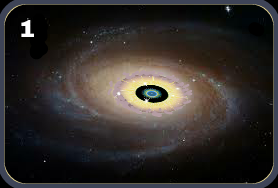 How a beautiful divine Galaxy "
Here this galaxy circulating critically, because one thing is going to happened in its circulation, it leaving behind some stable space Into the center of yellow colour space and then re-start circulating around adhisthan after some Moments of pause of imge no.1.
" It may be New Shristi "
After few minutes Here galaxy converting dangersbly itself in Left side. its may be Supreme Spiritual and Scientific Divine Knowledge," BARHAM- GIYAN " and latest divine realization in internal divine Universe during standing meditation. We never thought about it the day will come in our life God bless us showing this beautiful divine and Miracle Galaxy in our inner divine universe. We are very thankful to God every time.